The Supreme Court today directed the Delhi government and the MCD to levy an Environment Compensation Charge (ECC) ranging from Rs 700 to Rs 1,300 on commercial vehicles, largely trucks, entering the capital and cause pollution. A three judge special bench of Chief Justice H L Dattu, and Justices Arun Mishra and Adarsh Kumar Goel ordered that the charge should be levied on all commercial vehicles entering Delhi from November 1 on a trial basis for four months. It has been fixed as Rs 700 for light vehicles and 2 axle trucks and Rs 1, 300 for 3 axle trucks and 4 axle trucks and above. Passenger vehicles, ambulances and those carrying essential commodities like food items, fuel and m ilk to be exempted. It also ordered proper facilities at all entry points to receive tax so that there is no pile causing traffic jams. The bench said the government shall use the money to augment public transport , improve roads and make extra facilities for pedestrians and cyclists. “To review the mechanism, as mentioned in the signed order, the matter may be posted for further consideration in the 3rd Week of February, 2016”, the bench said. “Even though alternative routes are available for such traffic, only reason for such traffic entering into Delhi is to save higher rate of toll tax in taking such alternative routes. In the process, pollution caused by such traffic inflicts heavy cost on the health of the residents of Delhi”, said the bench. “Commercial vehicles entering Delhi spew close to 30 per cent of the total particulate load and 22 per cent of the total nitrogen oxide load from the transport sector. 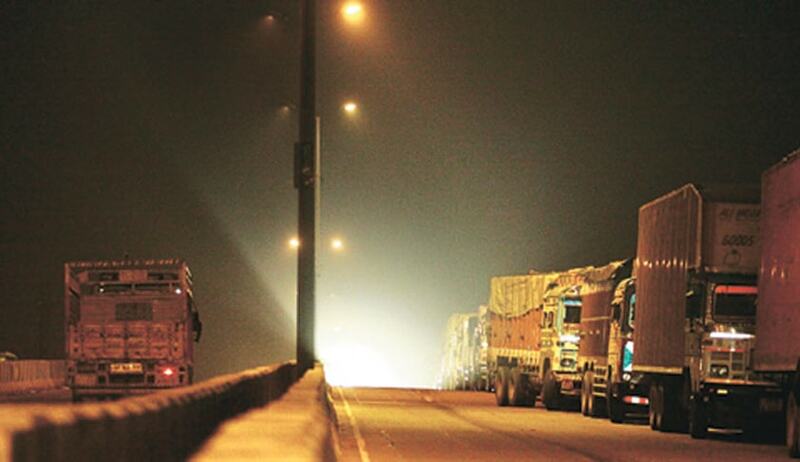 About 23 per cent of the commercial vehicles and 40-60 per cent of the heavy trucks entering Delhi were not destined for the capital but use it as a transit route to avoid high toll on other alternative routes, it said. The apex court had to make it clear that its order would supersede that of any other court or tribunal as the NGT had, even while the SC was seized of the issue and was about to pronounce order, imposed the pollution tax ranging from Rs 500 to Rs 1000 on the trucks last Wednesday. Following it, the supreme court which was to issue directions on Thursday, deferred the pronouncement. The SC stand was on expected lines after Dave and senior lawyer Harish Salve, the amicus curiae in the case questioned the jurisdiction of the NGT . CJI Dattu had then called for a copy of the tribunal judgment. “The NGT’s jurisdiction is under question. They have nothing…no powers to pass such directions..Only the supreme court can pass such an order”, Salve had said. “Once it knew that SC is seized of issue and is set to pass directions today, the NGT should have refrained from passing any order. Moreover it also doesn’t have the power to issue such general directions. As per section 14 of the NGT Act, it can only entertain civil cases were a substantial question relating to environment is involved”, said Dave. The apex court in its order also added: “The Governments of U.P., Haryana and Rajasthan will provide large size bill boards at the exit points towards the alternative highways to inform commercial traffic of the diversions. The said Governments will take steps to ensure that commercial traffic having destination other than Delhi use alternative routes. The said Governments will ensure that in the 3 course of implementation of this order, traffic jams and other inconvenience to the public is avoided”.